ST 168. 2011. viii, 302 pp. This volume contains an edition and facing English translation of Explanation of the Divine Temple and “On the Sacred Liturgy,” the two commentaries on the pontifical (hierarchal) Byzantine Divine Liturgy by St. Symeon of Thessalonika (†1429). This edition is based on MS Zagora 23, which contains extensive corrections and additions apparently added to the text by the author himself. 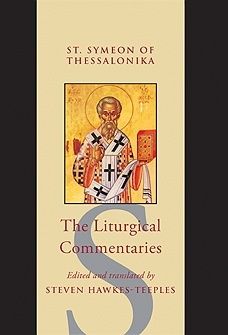 The book opens with a historical and theological foreword on liturgical commentaries and mystagogy by Archimandrite Robert Taft. The introduction surveys the life and career of St. Symeon, analyzes the structure and theology of the commentaries, and concludes with an account of technical and editorial questions. The index includes references to names, places, and topics in Symeon’s text and in the introduction and traces key terms in the commentaries in both Greek and English. Born in 1953, Steven Hawkes-Teeples grew up in San Antonio, Texas. He was baptized into the Catholic Church during his first year at San Antonio College. He completed a BA and an MA in French literature at the University of Texas at Austin. He entered the Society of Jesus in 1982 and was ordained a priest in the Byzantine-Ruthenian Church in 1993. Studying under Archimandrite Robert Taft, he completed a doctorate in Eastern Christian liturgy in 1998 with a dissertation on the liturgy in the commentaries of St. Symeon of Thessalonika. From 1997 to 2001, he was director of the Diaconal Formation Program of the Byzantine-Ruthenian Church in Pittsburgh, Pennsylvania. He has also taught at Canisius College in Buffalo, New York and at Regis College in Toronto. Since 2001 he has been teaching liturgy at the Pontifical Oriental Institute in Rome.